A few weeks ago, we were sent the Braun Thermoscan collection to test out on our family. At the same time, we all got hit with a nasty flu bug and were able to really give them a go. The package included their Braun ThermoScan5 Ear thermometer which we swore by with Aubrey, but had lost in the move before Poppy was born. 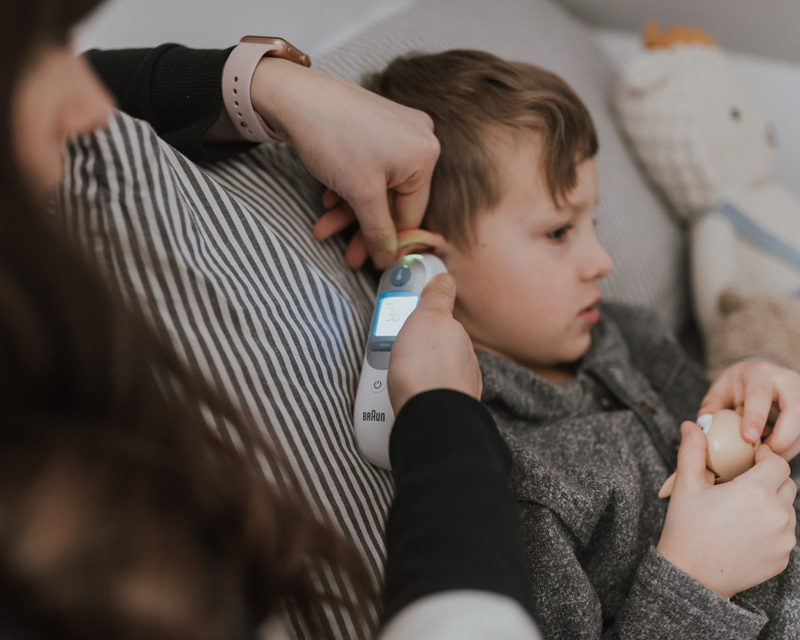 The other was new, the Braun No Touch + forehead Thermometer which I was really interested in.With the BraunThermoScan5 Ear Thermometer, you may have seen it in both your doctor’s office and hospital. It is the most accurate and reliable thermometer we have tried when it has come to our sick children. Through placing this thermometer in the ear canal, it can tell your temperature in a quick 2 seconds. Though, you do need to know that it is only activated by using the plastic throw away lens covers, so make sure you always stock up. They are however really easy to change with the button below the lens and can be put on without using your fingers. This helps to make sure germs aren’t spread through your family. 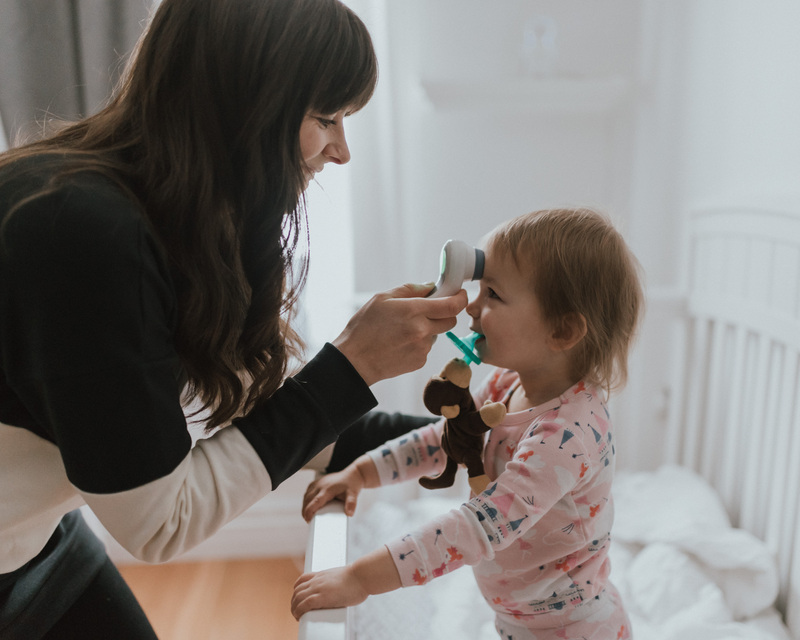 Another tip for a more accurate temperature reading is to pull on the earlobe to straighten it out before placing the thermometer in, this will allow the thermometer to read deeper and give you a truer temperature. Thanks to all of my Instagram followers for these tips while I was testing them out. The Braun No Touch + Forehead is new to us and I used it a lot that weekend to get a really good feel for it. 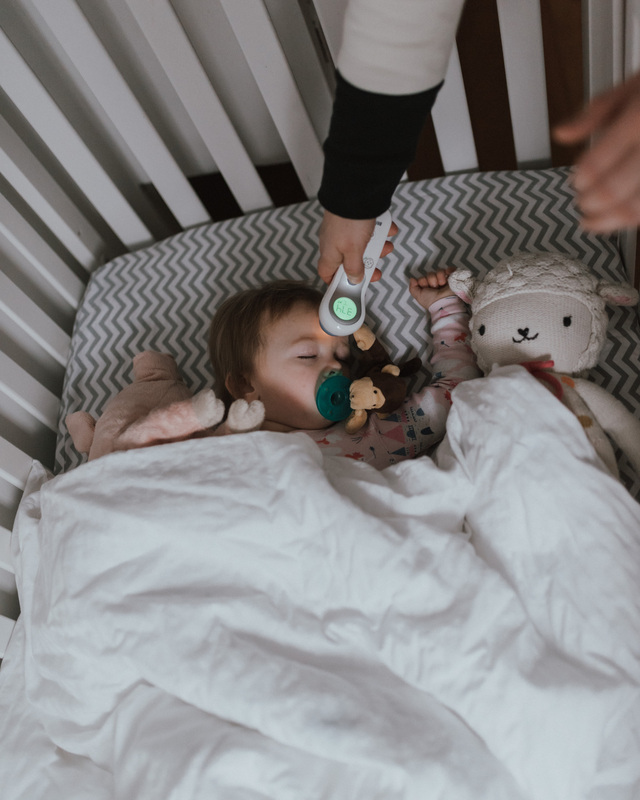 The idea of it is great, no touch allows you to take the temperature of your sleeping baby without waking them or poking them. It even has a quiet mode for that very reason. The forehead option is also great for when a child is awake. This one also has a color notifying screen making it easy for a parent to decipher if they need to worry. The screen lights up green if there is no fever present, yellow if there is a low-grade fever, and red if there is a fever. However, I will say, that I have found a slight variance between this one and the ear thermometer by half a degree. You also need to use a specific point on the forehead for accurate results. But, with those in mind, it seems a lot simpler of use, especially with a baby than the ear. Having one or both of these in the home with kids really helps, I can say that after the weekend we had had. 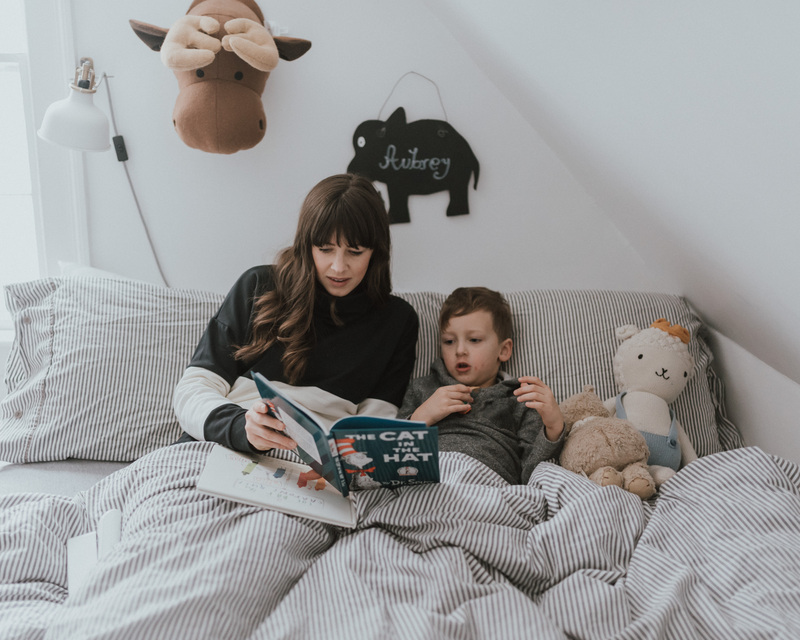 They are the perfect gift for a mom to be, so if you are about to have a baby or know someone who is, they are a perfect additive to that baby registry. That is how we got our first and are so happy that we did. 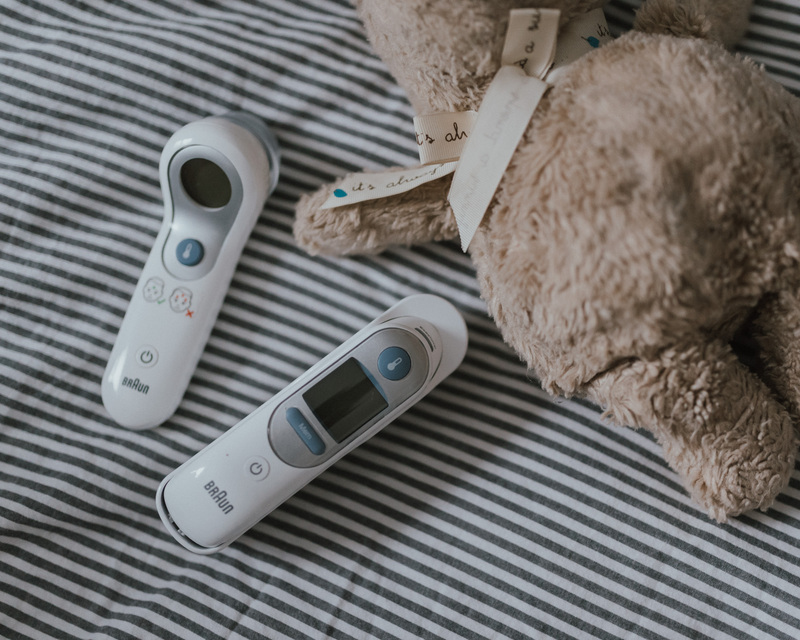 If you are in the market for a reliable thermometer for your home, the Braun ThermoScan5 and Braun No Touch + Forehead thermometer are both available at many places that you already shop like ToysRUs. Be sure you are #FeverReady! Thank you, Braun, for supporting my family by sponsoring this post. Wow, thermometers have certainly come a long way! I love how simple these ones are. Oh I could have used that forehead thermometer when my children were younger!!!!! Glad to hear you’re all feeling a lot better.